Members in Brazil, DC Logistics have transported 10 jabuticaba trees (Brazilian grape) from Brazil to China by ocean on a 37-day journey as per the requirements of a company specialised in plants. The trees were moved from Antonina in the Brazilian state of Paraná to Shanghai in China. Leandro Ribinski of the Inside Sales Department at DC Logistics Brasil comments; "When you think of cargo transportation then containers carrying goods like machinery, auto-parts or food may come to mind. Well this shipment may surprise you and make you think differently! This type of operation is not ordinary in Brazil nor in the world." The trees, which are approximately 6m long each, were carefully laid on flat rack containers. 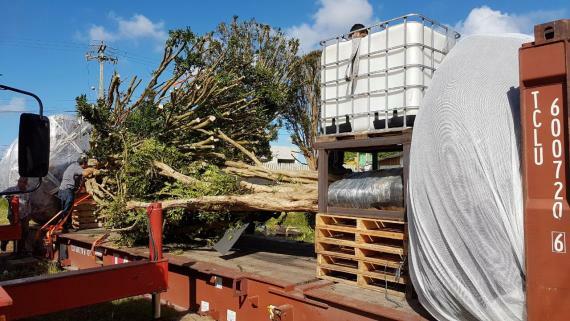 Mr. Ribinski continues; "The trees roots received a chemical treatment and an irrigation device was placed beside them on the container to keep them hydrated and healthy so they arrived in a sound condition at the destination. The operation was only possible due to a special authorization granted by the Brazilian Ministry of Agriculture, Livestock and Supply." Managing Director, Mr. Guilherme Mafra points out that transporting these trees "... was a great opportunity for DC to contribute to the planting of Brazilian fruit trees on Chinese soil. These unique operations reinforce why DC Logistics Brasil has been a highlight in the sector for the last 24 years." The operation inside the origin port of Paranaguá, which is one of the largest container terminals in South America, was carried out in partnership with TCP, the company that manages the container terminal itself. After receiving investments of BRL 365million (one of the largest private incentives in recent years in Brazil), TCP has the capacity to handle 1.5million TEUs a year with 320,000sqm of storage space. Three 879m-long berths are also available as well as exclusive berths for RORO operations.